"Vigorously argued, immersed both in Scripture and in the literatures of theology and philosophical hermeneutics, overflowing with provocative ideas, this is a book which both draws upon and furthers the contemporary renaissance of Christian doctrine. For anyone wanting to discover lively and generously orthodox Christian theology, this will be an excellent place to begin." -John Webster, University of Aberdeen, Scotland, and author of Holy Scripture: A Dogmatic Sketch and Holiness. Observing a strange disappearance of doctrine within the church, Kevin Vanhoozer argues that there is no more urgent task for Christians today than to engage in living truthfully with others before God. He details how doctrine serves the church - the theatre of the gospel - by directing individuals and congregations to participate in the drama of what God is doing to renew all things in Jesus Christ. Taking his cue from George Lindbeck and others who locate the criteria of Christian identity in Spirit-led church practices, Vanhoozer re-locates the norm for Christian doctrine in the canonical practices, which, he argues, both provoke and preserve the integrity of the church's witness as prophetic and apostolic. Kevin J. Vanhoozer is Research Professor, Trinity International University. He is the author of Is There Meaning in This Text? (Zondervan). - Publisher Critiquing George Lindbeck's highly influential The Nature of Doctrine: Religion and Theology in a Postliberal Age (1984), Kevin Vanhoozer proposes a radical paradigm shift from Lindbeck's "cultural-linguistic" approach to Christian theology. Christian identity, he argues, is not formed within our human selves or within Christian community; rather, it is formed wholly outside of ourselves, in our given script: the Holy Scriptures. In a sustained and systematic argument, Vanhoozer describes how Christian doctrine is the drama of history, of how the Christian community, guided by the direction of the Holy Spirit, has come to live out the Christian life, as revealed in Scripture. In focusing on the role of doctrine in the life of a believing community, Vanhoozer claims that the Christian's vocation is to discern and to play one's role in the drama of redemption with "creative fidelity." About "The Drama of Doctrine"
Critiquing George Lindbeck's highly influential The Nature of Doctrine: Religion and Theology in a Postliberal Age (1984), Kevin Vanhoozer proposes a radical paradigm shift from Lindbeck's "cultural-linguistic" approach to Christian theology. Christian identity, he argues, is not formed within our human selves or within Christian community; rather, it is formed wholly outside of ourselves, in our given script: the Holy Scriptures. In a sustained and systematic argument, Vanhoozer describes how Christian doctrine is the drama of history, of how the Christian community, guided by the direction of the Holy Spirit, has come to live out the Christian life, as revealed in Scripture. In focusing on the role of doctrine in the life of a believing community, Vanhoozer claims that the Christian's vocation is to discern and to play one's role in the drama of redemption with "creative fidelity." 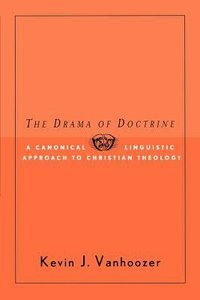 Customer Reviews For "The Drama of Doctrine"
A weighty academic tome, yet still interesting and relevant.The Drama of Doctrine by Kevin Vanhoozer is a convincing attempt to establish a fresh approach to Christian doctrine - Canonical-Linguistic theology. Vanhoozer observes with concern the decline of doctrine in contemporary Christian churches, and argues that theology is desperately needed as a vital foundation for the life of the church. "Sound doctrine - authoritative teaching - is vital for the life of the church, and hence for the life of the world". The Canonical-Linguistic approach to theology attempts to take seriously the constructive contributions of postmodern literary theory without abandoning the essential foundations of historic Christian orthodoxy.